The UI Smart Import is a tool that helps catch errors in files that will be uploaded to Moodle. The following is a basic guide for using this feature. In your upload file, name the NetID column "NetID". This tells the Smart Import what field it is and lets it check to verify all of the students are enrolled and have correct NetIDs. 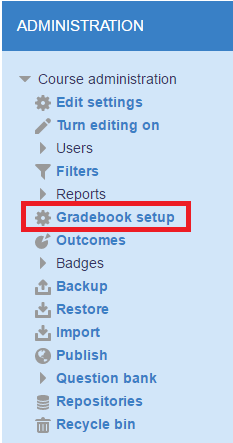 In the Administration block, click on Gradebook setup. Click Import to expand options. Then, select UI Smart Import. Click on Choose a Plain-Text Grade File (tab/csv)... and upload your grade file. Moodle will spend some time processing the file. When it is finished, a box will pop up below those buttons that will report whether the file is okay ("Precheck passed") or list any "Bad Rows". The bad rows are automatically removed from the grade file up above. If you need to edit a NetID and put it back in, you can edit it, then, copy/paste it into the box above. This will initiate a new Precheck to make sure the data file is now okay. When you're ready, click Upload grades. This will process the file. Under the name of your assignment (the name of the Excel column in your file), select the name of the grade item in Moodle that you want to import to. Click the Upload grades button. It may take a bit of time and the page will continue to look like it's loading.